Instructor's Guide not included. This is part of your History / Bible / Literature E and Grade 4 All-Subjects Package for Returning Sonlighters. 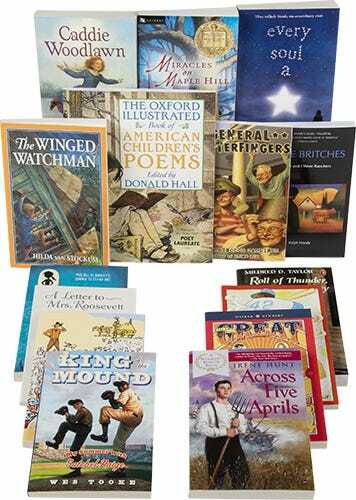 This collection of fifteen books is included in History / Bible / Literature E. If you don't need notes or a schedule, but are just looking for some excellent supplemental reading to share with your children, this superb collection is for you! Across Five Aprils is absolutely unique in children's literature: It focuses on the western front during the five Aprils of the Civil War. (Did you even know that there was a western front?) Seen through the lens of one family's experiences, one of the most powerful scenes occurs when two brothers decide, both according to conscience, which side they must fight for – and they pick opposite sides. I love that this introduces nuance into what sometimes is a very cut-and-dried narrative of South = bad, North = good. Real history, like real people, and real problems, is far more complex than that. There's a book about the common New England practice of making maple syrup, and the almost superhuman attempt to build the first enormous Ferris Wheel at the Chicago World's Fair. These books include good topics for discussion, such as racism in Roll of Thunder, Hear My Cry (described as "life-changing"); shell-shock; the Great Depression; the challenges of immigration. You'll read funny books (General Butterfingers is literally laugh out loud funny), and poignant books (Little Britches will touch you deeply). A wonderful, wonderful collection of reading. An historically accurate portrait of family life in the polders and among the windmills in Holland during the last years of Nazi occupation during WWII . . . and the months after, as families began to come back together. One of those "Wow!" books: a collection of delightful poems for young people arranged according to the birth dates of the authors -- beginning with anonymous native Americans and continuing to the present day. Award winner set in the post-Civil War South. A heartwarming Newbery Medal winner. Dad has returned from World War II a changed man: withdrawn, touchy, unable to work. The family moves back to the family farm where dad gets the healing he needs. Ralph is barely 8 years old when his family moves to Colorado for the sake of Dad's health, and the family tries to make a go of it on the ranch. Classic true story of ranching in Colorado in the early 1900's. When Nick is released from the hospital after suffering from polio, he's sure his father will never look at him in the same way again. Once the best pitcher in youth league, Nick now walks with a limp and is dependent on a heavy leg brace. He isn't sure he'll ever return to the mound. When Nick starts working for Mr. Churchill, owner of a semiprofessional team, he meets Satchel Paige, arguably the best pitcher in the world. Not allowed into the major leagues because of his skin color, Satchel teaches Nick that some things can be overcome with hard work and dedication, and that just because you're down, you're most certainly not out. Eleven-year-old Walter can't believe his eyes when he sees the eviction notice from Ralph, the rotten nephew of his old friend, General Britt. It isn't so bad for Walter and his mother, who also lives there – she would have no trouble finding another housekeeping job to support them both. But what about the old soldiers, the last surviving members of the crack World War II rescue force called the Spitzers, who saved the general's life more than forty years before? This warmly humorous novel shows two very different generations banding together to outwit a cunning adversary in order to see justice and honor prevail! Mass. Three narrators: a cheerful girl who lives at an astronomy camp, a girl who wants only to be beautiful and popular, and a chubby boy who ignores school. They unexpectedly converge at an event for a solar eclipse. They each find their way. They become unexpected friends. They deal with real pain and loss, and think about how to move forward. Delightful. When the bank forecloses on her family's home during the Great Depression, 11-year-old Margo Bandini writes to Eleanor Roosevelt for help. In 1947, a Chinese girl comes to Brooklyn, where she starts to feel at home and to make friends. "Git along, little . . . turkeys"? Yep! In 1860, a fifteen-year-old boy attempts to herd one thousand turkeys from Missouri to Denver, Colorado, in hopes of selling them at a profit. Engrossing story about the first—and largest—Ferris Wheel ever built. Told by one of the workers who built it. Eland. Middle child Sunday Fowler is too young for her sisters and too old for her brothers. How can she stand out in such a large family? Her opportunity comes when the family moves to a small town so her father can renovate the town library, and she discovers a mysterious manuscript in the basement. Charming.